Made with seaweeds, flaxseed meal and digestive enzymes, SeaMeal is an overall wellness supplement that provides your pet with trace vitamins, minerals, amino acids, omega 3 fatty acids and digestive enzymes. 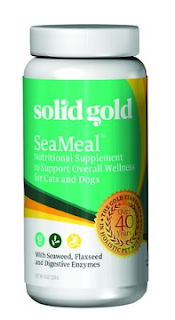 SeaMeal can be very helpful for dogs and cats with skin and coat issues and for those that may have some digestive issues like chronic vomiting or diarrhea. Made with red, green, and brown seaweed that provides vitamins, minerals, amino acids, and antioxidants. Easy to administer: just sprinkle on top of your pet's meal at each feeding. Thank you Chewy.com for sending me this product for free in exchange for an honest review. I was no paid for this and all opinions expressed are 100% my own. I am all for making sure my dog is healthy and this is a great option for those pets who have some digestion issues. My dog has had moments but not all the time. My Kiah girl, is being a brat about this on her food. She has refused to finish the food I know she loves when this is on. I have had to sprinkle less than the suggested amount to really mask it from her, and that has worked! I guess I can't really blame her as I know I would not be a fan of eating seaweed either! I will only give it to her a couple times a week to help keep her tummy more calm. She really only has an upset tummy a few times a year but I think this product will really help when those flare ups happen.